This case involves gingival recession that followed orthodontic treatment. Although the recession is mild in the lower right and left bicuspid areas there is only a thin zone of gum tissue remaining followed by cheek tissue. These cases are considered unstable and further gum recession is expected until an adequate zone of gum tissue can be reestablished. A referral to a Periodontist was made for assessment and treatment. Trying to get tooth root surfaces covered following gum / gingival recession is difficult. Part of the difficulty stems from the fact that there is no blood supply from the exposed root surface to nourish the graft. Techniques that use the surrounding tissues re-approximated to nourish the graft improve the chances of achieving root coverage because of the increased blood supply. The tunnel procedure, while very tedious, maintains the maximal blood supply. 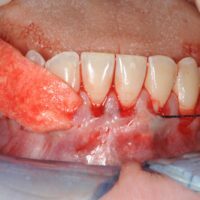 Although the tissue is surgically detached from the bone, it is not incised at the papillae area thus its blood supply is maintained at its base as well as the papillary region. The attached pictures demonstrate this principle. Prior to creating the tunnel, the tooth root surfaces are cleaned. They are scaled smooth and can be treated with chemical agents, Citric acid or a pH neutral 24% EDTA, to further purify their surfaces. In this case, Alloderm Dermal Matrix, was used instead of the patient’s own tissue from the roof of the mouth. Alloderm is cadaver skin which has been processed to remove the cells leaving only the connective tissue matrix. It is equivalent to using the patient’s own tissue, but avoids the pain and morbidity post surgically with donor site. It is also used when there is a large area of grafting to be done at one time because there is a limitation to the amount of connective tissue that can be harvested from the roof of the mouth at one time. Alloderm also provides a dimensionally consistent piece of tissue. For smaller areas, it is my own experience, that the patient’s tissue has the best results, and avoids the extra expense of the Alloderm material. The Alloderm comes freeze dried as in the pictures above and must be rehydrated prior to use. Sterile saline is typically used. Here we are using a variation by rehydrating the Alloderm in the patient’s own blood, which has been processed to create platelet rich plasma. As the Alloderm rehydrates in this mixture concentrated growth factors released from the platelets promote healing. The rehydrated Alloderm is placed inside the created gingival tunnel. A suture is secured at both ends. 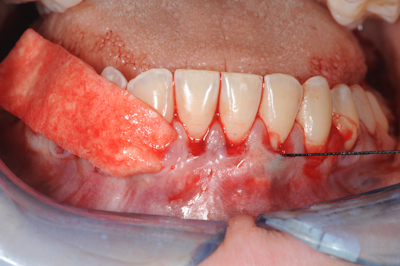 The suture is passed under the gingival papillae in both directions from the center of the surgical site. The Alloderm follows from the tension of the suture. Once the Alloderm is secured in place the sutures are removed at both ends. The margins of the gingival tunnel are re-approximated to cover all of the Alloderm which is now covering the root surfaces as well. Anti-inflammatory medications such as Ibuprofen, antibiotics and Peridex oral rinse are typically prescribed following these types of procedures. When the patients own tissue is harvested, Hydrocodone is supplemented as well. At only one week post operative, there has been considerable healing and good root coverage. The patient experienced very little discomfort with this procedure.